Hello there. My name is Professor Pennantia. Tohozi is a newly developed region inhabited by strange and unique creatures we called Pokemon. 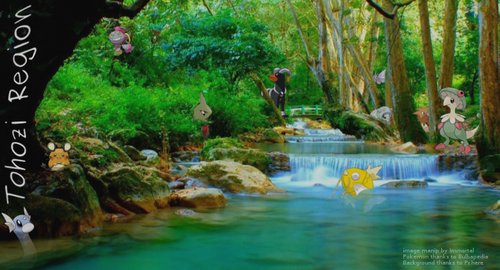 Most of the Pokemon we've discovered on Tohozi are invasive species that were once brought over to the region. We're looking for up-and-coming trainers, like you, to travel and explore the region. We hear that Pokemon not change and adapt to their environments through a new unique process called evolution, but that some are influenced through their travels with humans to evolve as well. Well, what do you say? Will you help me with my research by traveling the region of Tohozi with your very own starter Pokemon? A new Pokemon roleplay adventure that opened up in January, 14th, 2019. We allow players to keep and collect all of their characters on one singular account, or on multiple IC accounts connected through a singular OOC account. WE encourage trainers to follow the normal path of a Pokemon, or to follow the beat of their own drums. Experience is gained through Pokemon battles, Pokemon contests, and Pokemon practicing and training. ✒ Follow a non-linear path as you explore the region. We only recommend that you face and battle the GYM Leaders in a linear path, since they are ranked by different levels. ✒ Relax along the way with fun games. We have the ole' Game Corner, Pokemon Daycare (where you can make up fun adventures as the Pokemon you leave behind! ), a Tunnel Mine where trainers sometimes find rare and valuable artifacts, the Radio Tower where trainers can enter cool competitions, and even a Prehistoric Safari!